Home/Healthcare/Myths About Lumbar Puncture: Is There Any Truth? Lumbar puncture is the procedure used to access a sample of cerebrospinal fluid from the lumbar region. A patient lies on his side so that the doctor may have easy access to the lower back from where the fluid has to be taken. Anesthesia is given to numb the area and a needle is then inserted to draw spinal fluid. The procedure does not cause pain although patients may feel a little sore from lying in a position for the procedure. The procedure does not take longer than an hour but the patient may also need some time to recover after the procedure. 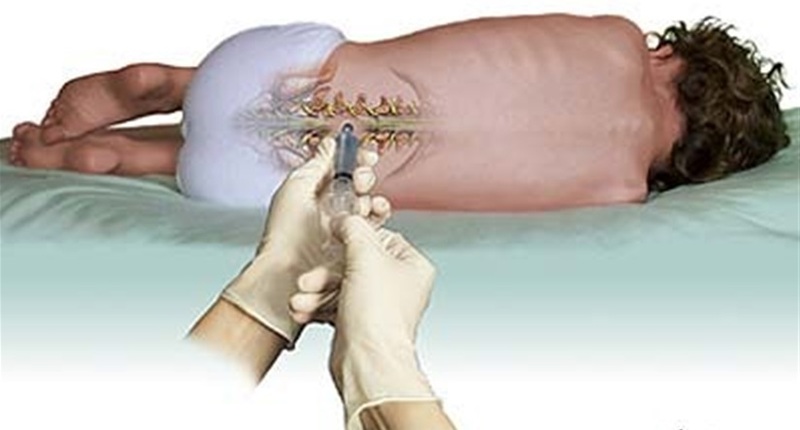 Lumbar puncture is carried out to diagnose any brain or spinal disorders such as sclerosis. Myths have been circulating about the procedure being fatal and causing paralysis which is certainly not true. There are several myths about lumbar puncture as people associate pain and paralysis as a result if the procedure. All such myths are actually fables with no holding truth. The patient only suffers from a sting sensation when anesthesia is given. There is no discomfort caused other than than throughout the procedure as the numbness does not make you feel pain. Patients also sleep occasionally during the lumbar procedure. Lumbar puncture cannot cause bacterial meningitis as the procedure is safe if carried out properly. However, the diagnosis can be made for bacterial meningitis through lumbar procedure which is why people often associate them. The possibility of headache after the lumbar procedure is around 10 to 30% as the fluid filled sac around brain and spinal cord is punctured. Spinal headaches are common but recent research methods use a different shape and size of needle to ensure minimum fluid leaks out. There are rarely any chances of damaging the nerves or cause paralysis from lumbar puncture as the spinal cord ends about 5 inches above the spot where needle is inserted. The doctor will readjust the needle if patient feels any discomfort during the procedure therefore there is no chance of having paralysis. Only minor side effects of the procedure may be experiences and nothing more than that. Apart from headache which occurs because of leakage of spinal fluid, there may be minor side effects of the procedure. The procedure may cause backache and bleeding from the area where needle was inserted. These symptoms are manageable and are not fatal in any way. The patient of lumbar procedure can resume his job if it does not involve strenuous activity although it is still recommended to plan some rest. A medicine for pain relief can be taken if you suffer from headache or back ache as it will soon go away. What’s the Truth about Lumbar Procedure? The lumbar procedure should not be managed according to myths as they only create misconceptions. Also, people should not go for places carrying out outdated lumbar practice as new reasarch methods have been proved to cause less pain. The size and shape of the needle inserted is very important as it will not more fluid to leak out which will also not cause headaches. The patient does not have to lie still for an hour if the process is carries out smoothly. Lumbar procedure is a smooth process if carried out professionally with latest approach. All the rest are misconceptions about the procedure and hold no truth.